iPhone available now & Android releasing soon! Make better purchasing decisions wherever you are - now with more options in the palm of your hand. 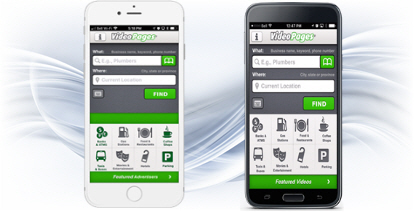 Find what you need from approximately 16 million U.S. and Canadian businesses with the free VideoPages® Mobile App! Take advantage of timely video promotional offers, recorded and submitted through our app by local businesses! Watch national and local advertiser videos for special deals and great savings. View user contributed video testimonials and photos about nearby businesses. Use GPS, location-based searches to discover the businesses around you. The VideoPages Mobile App provides detailed business information including: videos, photos, promotions, testimonials, contact information, hours of operation, addresses, maps, products, services, brands and much more. Share business profiles or add them to your favorites list. Submit Video Resumes to businesses of interest and gain an edge over other job applicants! Submit videos and photos using the free VideoPages Mobile App for a chance to win great prizes!